The recent decline in equity prices has once again highlighted the importance of asset allocation and portfolio diversification. As will be demonstrated in this note, although corporate bonds and hybrid securities have some exposure to credit risk, their valuations have held up relatively well during the recent period of equity market turmoil. This highlights their usual defensive income qualities for investors seeking to manage their risk across a diversified multi-asset portfolio. 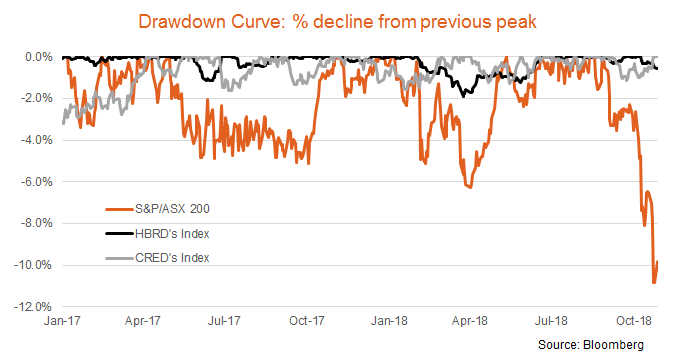 As seen in the chart below, Australian equities have endured some notable declines over the past year or so, with the recent 10% decline in the S&P/ASX 200 Index from its high of late August the most pronounced. As also evident, the decline in total returns for corporate bonds and hybrids securities has been nowhere near as great, at least as measured by the respective indices that BetaShares Australian Investment Grade Corporate Bond ETF (ASX Code: CRED) and the BetaShares Active Australian Hybrids Fund (managed fund) (ASX Code: HBRD) aim to track. Note: Past performance is not indicative of future performance. You can’t invest directly in an index. The performance of corporate bonds and hybrid securities tends to be less volatile than that of equities over time for two critical reasons. For starters, investors in corporate bonds and hybrids stand ahead of equity investors in the corporate capital structure – in the event of a corporate insolvency, bond and hybrids holders have a somewhat higher probability of getting at least some capital return (1). This makes their valuations less subject to concerns over corporate performance during economic downturns. Secondly, the income payments promised to corporate bond and hybrid security holders – upon which their valuation is based – tend to be more reliable over time than dividend payments to equity investors. More generally, equity valuations are much more sensitive to changing investor perceptions of corporate profitability over time. Of course, in exchange for this reduced volatility in returns, both corporate bonds and hybrids tend to offer somewhat smaller returns than equities over time, as the latter also benefit from growth in corporate earnings and dividends. As evident in the chart below, investors seeking attractive income opportunities – with less downside risk exposure than equities – have a number of options to choose from along the risk-return spectrum. Note: Yields are variable and may be lower at time of investment. 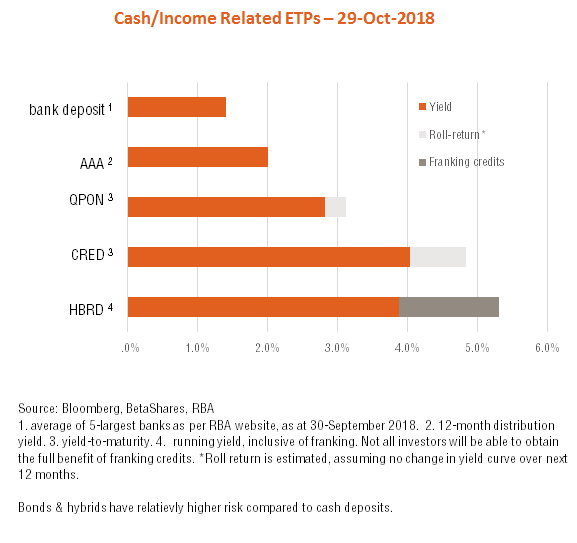 While the prevailing one-month term deposit on offer from major banks is only around 1.5% p.a., the BetaShares Australian High Interest Cash ETF (ASX Code: AAA) can be bought and sold on the ASX with T+2 liquidity and currently offers a higher monthly income return of around 2% p.a., net of fees. And an even higher income return of just over 3% p.a. is currently available through the BetaShares Australian Bank Senior Floating Rate Bond ETF (ASX Code QPON), more information on which can be found here. As at 29-October, moreover, the CRED ETF had a total prospective one-year income return of 3.9% p.a. or almost 5% p.a. if one factors in potential “roll return”(2), whereas the HBRD Fund had a prospective income return of just over 5% p.a. including franking credits. (1) It should be noted that hybrids generally carry higher credit risk that corporate bonds and can be subject to complex terms and conditions. 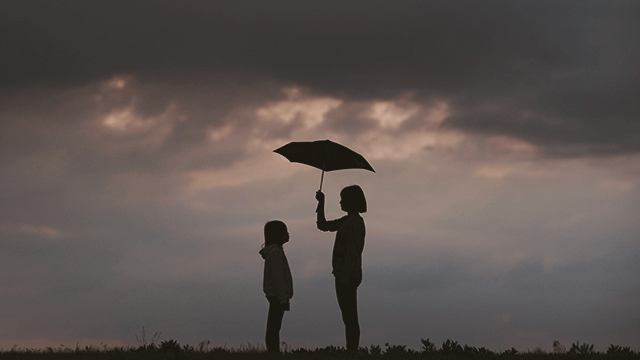 It is for this reason that we believe that investing in this space via a diversified, professionally managed active fund, such as the HBRD Fund, has some merit. (2) This estimate is based on a yield-to-maturity at this date of 3.9% p.a., plus a potential “roll return” of 0.7% over a year. More information on these return measures is provided here.